I’ll be the first to admit, despite 50+ years of commodity trading experience, it took me a good three months to grasp the power of the AMS DeltaPrint © OrderFlow Suite of tools including MarketProfile, DeltaPrint and BookFlow. We at AMS developed and now offer the following because that is what you asked for. Our tutorials are comprised of detailed screenshots of the AMS DeltaPrint © OrderFlow Suite tools, what they exhibit and how best used. For a minimum monthly license of $99.00 you’re welcome to join. If you “really” want to learn how to use these tools we suggest the $199.00 quarterly license (three month) and not just for its discounted price. The Wizard is on hand live to listen to and answer questions while imparting 50+ years of experience upon those interested in hearing it. (in and of itself well worth the $199.00 quarterly license). Don’t be embarrassed or foolish. It takes most traders upwards of three months or more to fully understand how to utilize our tools. To sign up for the quarterly license click here. With the purchase of a lifetime membership you’ll receive an hour of one-on-one time with our developer Niels. If you are interested in purchasing a lifetime membership click here. Additional levels of tutorial services are available upon request with prices ranging from $699.00 to $25,000. For $699.00 the Wizard will spend a couple hours with you; Niels will spend up to two hours with you for $999.00; and $3,000.00 gets you a trading day with Niels. For $15,000 to $25,000 Niels will come to your location for an agreed period of time and instruct up to five participants. If these levels are of interest send us an email at support@amstradinggroup.com. Quite often our clients design their own tutorial programs and within reason we are happy to oblige but it is up to you to initiate contact and ask. We know how powerful the AMS OrderFlow, BookFlow, Market Profile and DeltaPrint tools are. We also know that you can’t use them if you don’t know how. Everyone wants to use the AMS DeltaPrint © OrderFlow Suite of tools. Learning how to use them is important and we at AMS are here to serve that need. DeltaPrint© visualizes and illustrates ‘real time’ data in a manner traders cannot see with conventional charts. Using tick data from your data feed DeltaPrint© through its FootPrint charts shows real market data in a clear, highly detailed format. These FootPrint charts are must have for every trader focusing on order flow. If you are not focusing on it you should be. In the illustrated sample, one price bar shows “998 X 462”. The “998” number on the left illustrates contracts traded at the “bid” while the “462” number on the right illustrates contracts traded at the “ask”. Traders see every “buy” and “sell” inside each price bar as the trade is made in real time and its impact upon price. 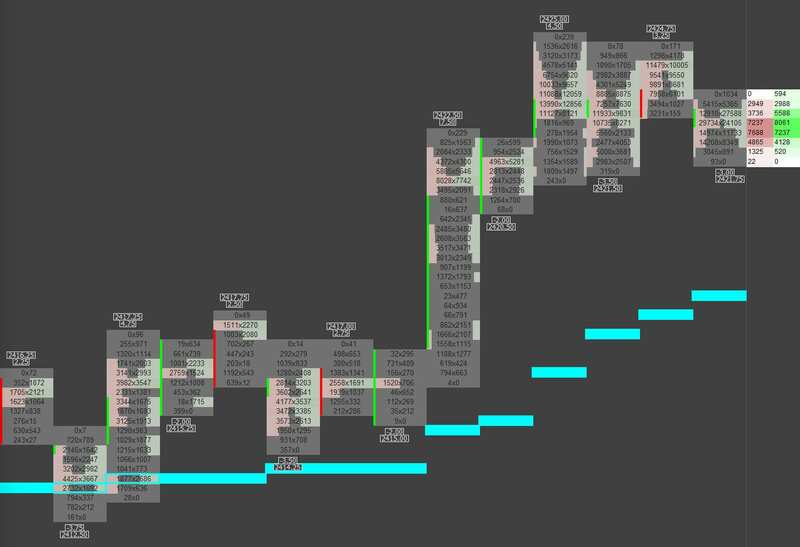 This clearly presented, highly detailed FootPrint illustrates the flow of the market in real time, giving the trader greater opportunity to timely react to current market conditions. 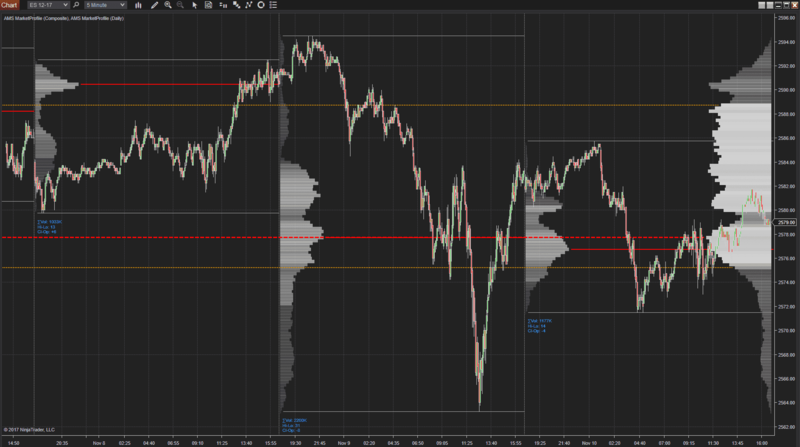 This extra layer of information illustrates “trapped” buyers and sellers enabling traders with more accurate trading levels and ranges to react to. The DeltaPrint© format applies a proprietary algorithm highlighting critical order flow imbalances. It continually interprets “buy” and “sell” imbalances in real time doing the hard work enabling the trader to interpret clearly and quickly what is displayed. BookFlow uniquely enhances the visualization and interpretation of Depth of Market (“DOM”) dynamics and the contents of the order book. BookFlow combines the real time and historical order book levels allowing the trader to view the orders being pulled or added in real time. MarketProfile charts enhance the identification of where one is in the trading day, defining support and resistance levels with greater accuracy and clarity employing volume and TPO profiles. Session statistics presents cumulative volume based textual information for each price bar. Each item is shaded based upon its relative value with custom colours available for buy volume, sell volume, total volume and text. 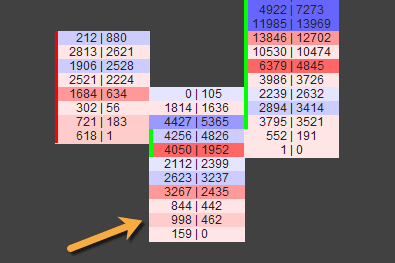 With respect to price levels, Session Statistics can plot Volume and Delta Profiles for today’s, yesterday’s or the “last ‘X’ number” of days on the right hand side of the display.